Congratulations to Dr. Sam Rowlands, Visiting Professor in the Faculty of Health & Social Sciences, who published an interesting Commentary in the BJOG together with Prof. Roger Ingham from the University of Southampton. 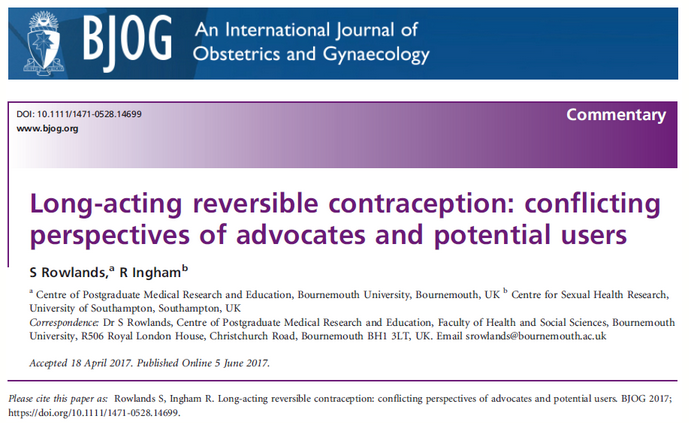 Their paper ‘Long-acting reversible contraception: conflicting perspectives of advocates and potential users’ argues that a patient-centred approach to contraceptive care is fundamental to women’s autonomy. The authors remind the readers that it needs to be appreciated that unintended pregnancy is most likely to be reduced by fulfilling the unmet need for contraception and encouraging those not using any form of contraception, or condoms only, to use a method of their choice accompanied by adequate instruction (where necessary) in correct usage.